Aircraft fuel leaks are serious problems. Beside the issue of wasting expensive aircraft fuel, a fuel leak can cause fuel starvation to your aircraft’s engines while in flight. It is worth the time and effort to perform aircraft fuel leak detection and repair appropriately, rather than rushing through to get an aircraft in flight quickly. The causes of fuel leaks range from stress and structural defects to degrading sealants. Additionally, the increase of cycle times in keeping aircraft in service longer coupled with the aircraft fuel systems inspection practices of some airline and corporate aircraft operators can make the issue worse. Therefore, a solid aircraft fuel maintenance process is critical to ensure safety of flight. Integral or “wet wing” – the fuel tank is part of the wing and includes the top and bottom wing skins. A large percentage of passenger and cargo aircraft have “wet wing” fuel tanks. Fuel cell – a rubber bladder is inside the aircraft wing. Tank – a fiberglass or built-up metal tank inside the wing. Finding the aircraft fuel tank leak source – you must play detective to find out the best repair method to stop a leak. Plus, you must know that each type of fuel tank has its own set of potential leak sources. For example, the “wet wing” fuel tank has rivets through the top and bottom aircraft skin and each could be a source of a leak. Another challenge with the “wet wing” fuel tank is the stress loads absorbed by the wings that can lead to loosening of bolts and fasteners as well as cracks, which can cause leaks. Aircraft fuel tank sealants are often a source of leaks. Sealants are affected by bad weather and hard landings causing the sealant to lose its bond to the aircraft. Where does the leak appear? Does the leak occur only when the tank is full? Does the leak stop when the tanks are half full or does it continuously occur? Perform an aircraft fuel systems inspection – a leak can travel a long way before you see a drip, so it is important to inspect panels and areas of the aircraft fuel tank that are not particularly close to the leak. Once the aircraft mechanic has completed the aircraft fuel leak detection, repairing the cause of the leak is the next step. 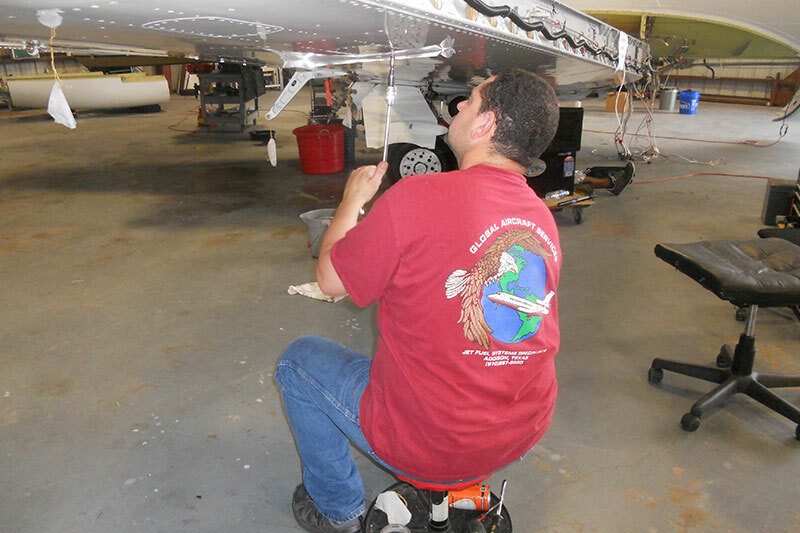 The aircraft fuel tank repair can occur either by having the aircraft mechanic on staff perform the leak repair, or by sending the fuel tank to a FAA-approved aircraft fuel tank repair facility. If sealant is the source of the leak, it is a best practice to have a fully-trained mechanic replace the sealant. This is a very specialized skill. Sealants must be applied according to rigorous standards provided by the manufacturers. In order to be approved, a vendor must send all aircraft mechanics to specialized training thereby ensuring they have the best information and appropriate training to repair aircraft fuel tank sealant. Once the aircraft fuel tank leak repair is completed, the fuel tank must be reinstalled by carefully following the aircraft maintenance manual procedures. It is important to look for leaks while installing the aircraft fuel tank. Because small leaks may not show up for 24 hours, the fairings should be left off until the aircraft mechanic can verify that there are no leaks. 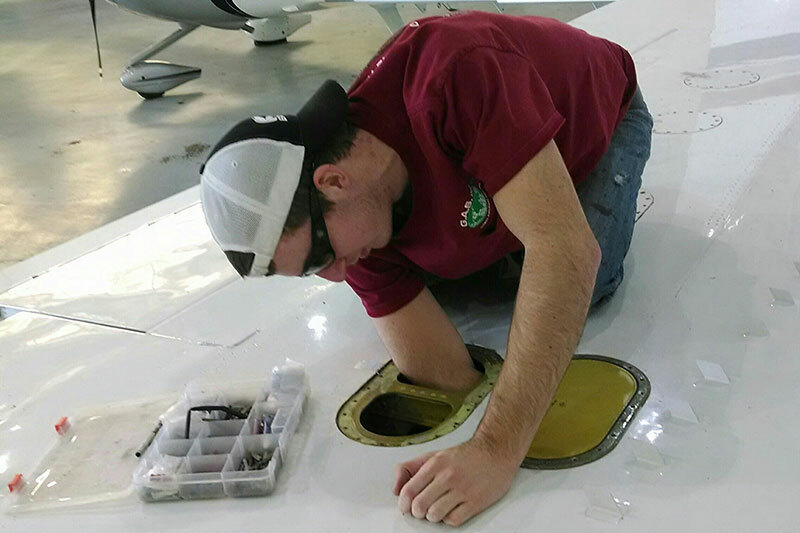 Aircraft fuel leak detection and repair takes skill, a thorough understanding of aircraft fuel tanks, and often specialized training in order to perform the repairs correctly. It is important not to rush the process of detecting or repairing aircraft fuel leaks, particularly since it can be difficult to find the actual source of the leak. The repair and installation also takes time to ensure the leak was correctly repaired, and that no new leaks have occurred during the installation process. Taking the appropriate amount of time to perform aircraft fuel maintenance will keep aircraft in flight longer, rather than grounded for numerous repairs.